Maybe the thought of spending more than two months’pay on a wedding dress never even occurred to you when you accepted the ring. Just a few short years ago, finding a beautiful and elegant wedding dress would have required an all-hands-on-deck manhunt and a considerable amount of spare time and some change. Not so today. And seeing that time and money are very precious commodities, luxuries not everyone can afford, there are quite a few options for you to consider when looking for an incredibly memorable wedding dress. Whether you’re looking for an unfussy gown for your beach wedding, trying to find a lace-adorned midi dress to wear to City Hall, or you’re going all out but still want something spectacular, there are so many options for you today to realize your dream. Like the rest of the fashion industry, the bridal world, too, is experiencing change. Many reputable designers have adopted the digital trend and are now offering their designs online. Can you really get a wedding gown delivered to your doorstep? Yes, absolutely. For many brides, the ability to purchase designer gowns in this most effortless way is a dream come true. Often the prices offered online are considerably lower than the dresses sold in stores due to lower overhead costs to designers, which affords savings to you, the bride. One thing to bear in mind is that some online bridal stores offer a try-on option, while others do not. If it is a brand that you are familiar with and which has a good reputation, then there should be no need to worry. Do your homework and check the seller’s policies and procedures. Today, an ocean of choices has become available online, which can often overwhelm and cause confusion. 1. Make a list of the features you wish for in a dress that would look good on your body type such as silhouette, neckline, sleeves, and fabric. Also list what you would like to avoid (I have laid this out clearly in my book, Your Bridal Style: Everything You Need to Know to Design the Wedding of Your Dreams. Read Chapter 5: Lines That Flatter: Choosing a Style for Your Figure, and Chapter 6: Wedding Dress Silhouettes). 2. Filter by price to make sure you’re staying within your dress budget. 3. Pick out a number of gowns that fit the aforementioned criteria. 4. Pin these on your online inspiration board or print them out so you can lay them all out and compare them. 5. Eliminate the dresses that do not match your needs. 6. Pay attention to details on the chosen dresses: note the fabric, construction, and how it drapes on the model. 7. Get help from those whose opinion you trust and make your decision. 8. Check the manufacturer’s measurement chart and determine the optimal size. 10. Find a good seamstress who has experience working with complicated gowns. Once your dress arrives, you will more than likely need some alterations. 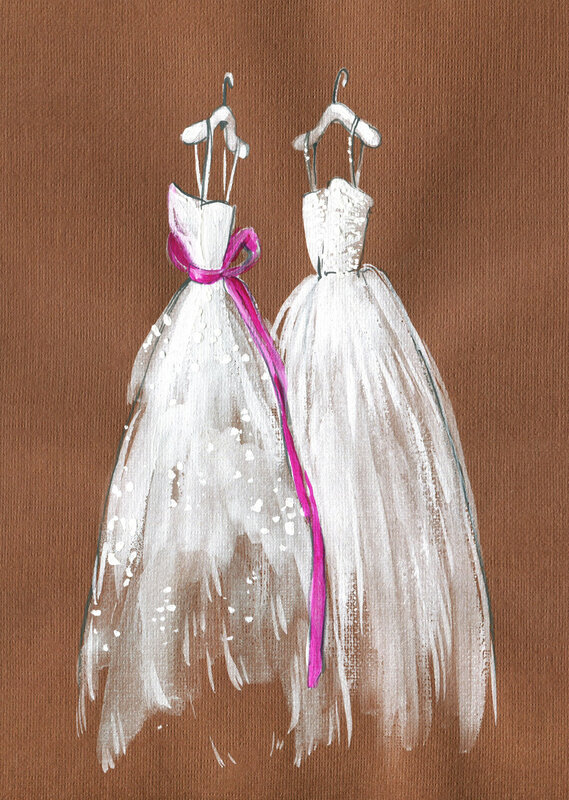 Here are just a few of the dresses from our St. Pucchi Collections made available directly from our design house to you, the bride, at a fraction of the cost…Visit www.stpucchi.com for all available styles. Unfortunately, in this day and age, the Internet is flooded with websites selling cheap imitations and fake goods, some even bold enough to use other designers’ original images to lure you into believing that you are, in fact, receiving an authentic designer dress. So, beware of some sites that offer bargain dresses. Sometimes a cheap dress can just end up being a headache and cost more than you bargained for. It is best to order directly from a designer’s website than from third-party vendors or those who pose as representatives. When a designer puts their name on a piece, it is a symbol of pride, and they are putting their reputation on the line. Investing in a reputable designer’s piece ensures that you are receiving a well-made garment of the best quality, an heirloom that you can pass on to generations. Rani St. Pucchi is an award-winning couture Bridal Fashion Designer, a Style & Image Consultant, and a Relationship Expert. She is a Bestselling Author, a Speaker, an Inspirational Coach and a Trainer. Her recent TEDx talk:Is Your Body Image Holding You Back has received worldwide acclaim. Rani’s #1 International Bestselling Books:Your Body, Your Style: Simple Tips on Dressing to Flatter Your Body Type; The SoulMate Checklist: Keys to Finding Your Perfect Partner; Your Bridal Style: Everything You Need to Know to Design the Wedding of Your Dreams; and her newly released Gold in the Cracks: Move from Shattered to Whole and Reveal Your Light — are available on Amazon and at Barnes & Nobles. Sample Sale Gowns + Our Current Favorites! We are kicking off 2019 in style with some brand new additions to our ongoing St. Pucchi sample sale! This week we've rounded some of our current favorite St. Pucchi sample sale gowns. Through January 31st, 2019 take an extra 40% off already discounted wedding gowns! That means a total savings up to 87% off a gorgeous St. Pucchi wedding gown. Our annual sale on sale will last thru January 31st. Since most dresses are one-of-a-kind make sure you get yours before it’s gone! View more pieces from the St. Pucchi Sample Sale Collections here. Laughing, crying, grinning till your cheeks are sore, you’ve become that wonderful cliché: The Happiest Woman in the World. If you were involved in deciding which type of ring you received, then you know the process was somewhat agonizing, yes? After all, a diamond is very personal and very precious. Besides, your diamond is the longest style commitment you will ever make. Did you know that each one of the seven most common diamond cuts reflects your personality? So, what does your diamond say about you? Oval: One of the most popular diamond shapes and great for the bride who loves an elegant yet classic aesthetic. Round: For the woman who wants a traditional look that will be timeless and classic and maximum sparkle, this is the diamond for you. Marquise: For the bride who knows her mind and moves to the beat of her own drum, who wishes to create the illusion of elegant, long hands, this pear-shaped diamond is perfect. Emerald: For the discerning bride who wishes to exude elegance and refinement, somewhat understated yet classic with an edge, the elongated shape and step-cut faceting of this diamond is perfect. Rani St. Pucchi is an award-winning couture Bridal Fashion Designer, a Style & Image Consultant, and a Relationship Expert. She is a Bestselling Author, a Speaker, an Inspirational Coach and a Trainer. Her recent TEDx talk: Is Your Body Image Holding You Back has received worldwide acclaim. Rani’s #1 International Bestselling Books: Your Body, Your Style: Simple Tips on Dressing to Flatter Your Body Type; The SoulMate Checklist: Keys to Finding Your Perfect Partner; Your Bridal Style: Everything You Need to Know to Design the Wedding of Your Dreams; and her newly released Gold in the Cracks: Move from Shattered to Whole and Reveal Your Light – are available on Amazon and at Barnes & Nobles. Let’s face it. Wedding dress shopping is not just another trip to a department store where you can pick a dress and take it home. Shopping for a wedding dress is a full-on endeavor, an expedition, and a mission that will stay in your memory long after the day is over. So, it’s a good idea to be well equipped and get your facts straight before you begin the search. For example, what is the difference between Guipure lace and Alençon lace? How about a bustle and a modesty piece? Aside from obvious silhouettes such as A-line, sheath, column, ballgown—some details can make any bride seriously confused and frustrated. If you would like to be well-versed, and have some answers at your fingertips, here are ten most commonly used terms to know ahead of your biggest shopping trip. 1. Alençon lace: Originally produced by hand in Alençon, a town in Normandy, France, it is a light, airy needle lace made of linen thread. This is one of the most popular and traditional laces used on wedding dresses. 2. Boning: Plastic or metal sewn into the bodice of the dress, especially a corset on a strapless wedding gown, to ensure the fit is snug and the fabric does not droop. 3. Bustle: The art of pinning a train and securing it by using hidden hooks on the back of the dress so it does not drag around on the ground after the ceremony. There are several different ways to bustle. The French bustle is the most popular, whereby the train is tucked underneath and pinned or hooked to the fabric of the dress. 4. Chantilly lace: Delicate lace that originates from the city of Chantilly in France. This is one of the more popular laces used on wedding dresses. It comes in small, detailed patterns and look best when worn sheer over the arms, back, and neckline. 5. Court: Refers to a type of train that is short—generally three feet from the waist—and drags a few inches on the ground. 6. Crêpe: Thin, soft fabric with a slightly wrinkled surface, ideally used on a draped wedding gown or one that is form-fitting and clings to the body. Great for a beach wedding. 7. Dropped waist: A longer bodice attached to the skirt at the seam that falls below the natural waistline. Gives an illusion of a longer torso and looks best on taller women. 8. Guipure lace: French bobbin lace, used on the bodice, skirt, or train of a wedding dress. It is heavier than Chantilly lace. 9. Mermaid: One of the more popular skirt styles, where the bodice is fitted and then flares from under the hips in a mermaid-tail fashion. 10. Modesty piece: A piece of fabric that is sewn into the middle of the neckline, especially a V-neck, to make it less revealing. Rani St. Pucchi is an award-winning Couture Fashion Designer, a Style & Image Consultant, and a Relationship Expert. She is a Bestselling Author, a Speaker, an Inspirational Coach and a Trainer. Her recent TEDx talk: Is Your Body Image Holding You Back has received worldwide acclaim. Rani’s #1 International Bestselling Books: Your Body, Your Style: Simple Tips on Dressing to Flatter Your Body Type; The SoulMate Checklist: Keys to Finding Your Perfect Partner; Your Bridal Style: Everything You Need to Know to Design the Wedding of Your Dreams; and her newly released Gold in the Cracks: Move from Shattered to Whole and Reveal Your Light – are available on Amazon and at Barnes & Nobles. It’s time to put the final finishing touches to your plans. While some things could go wrong on your wedding day, remember your attitude matters. Laughter, not tears, will make your day that much more memorable and unique. Here is your final checklist that will take you to a smooth and well-planned day void of any last minute hiccups! ___ Confirm delivery and pick-up times for all attendants’ attire. ___Make delivery arrangements for your wedding cake. ___Meet with ushers and assign them duties. ___Secure a dressing room for your bridesmaids for your wedding day. ___Finalize your honeymoon plans and confirm all reservations. ___Arrange for transportation to and from the airport (if flying) or car to your honeymoon destination. ___Write thank-you notes: It is best to do this as you receive or open your gifts. ___Have your final dress fitting. ___Arrange for pickup of the bridal ensemble. ___Go in for a dry run with a professional makeup artist and schedule your day-of-the-wedding appointment. ___Schedule a manicure/pedicure for the day before your wedding. ___Pick up your marriage license. ___Finalize and memorize your wedding vows. ___Write toasts for the rehearsal dinner and wedding reception. ___Finalize arrangements with your catering manager and liquor representative, if needed. ___Submit a final shot list to your photographer and discuss positioning with your videographer. ___Send your final playlist to your DJ or band. ___Arrange for preparation, storage, and break areas for the musicians/DJ at the reception venue. ___Review RSVPs and contact guests who have yet to reply to your invitation. ___Finalize the list of reception guests. ___Confirm the final headcount with your caterer and review details, preferably in writing. ___Arrange for table cards to be set up at the reception venue. ___Determine the placement of programs at the ceremony venue. ___Give last-minute requests to the vendors. ___Confirm your honeymoon travel arrangements. ___Start packing for your honeymoon. ___Pick up your wedding dress (if you haven’t already). ___Prepare announcements to be mailed immediately after the wedding. ___Designate someone to look after your home while you are on your honeymoon. ___Finish packing for the wedding night and the honeymoon. ___Reconfirm transportation arrangements for the ceremony and reception. ___Rehearse the ceremony and attend the rehearsal dinner. ___Give wedding rings to the best man and maid or matron of honor to hold. ___See hairdresser and makeup artist: Beautify. ___Bride should transfer her engagement ring to her right hand.